Mahmoud Ahmadinejad at the United Nations. 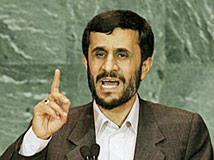 At his United Nations General Assembly debut in September 2005, the president of Iran, Mahmoud Ahmadinejad, concluded his speech on a weird note, with a prayer for the appearance of the Shiite messiah, the mahdi: "O mighty Lord, I pray to you to hasten the emergence of your last repository, the Promised One, that perfect and pure human being, the one that will fill this world with justice and peace." Then, back in Iran, Ahmadinejad gave an even stranger account of his U.N. speech: "one of our group told me that when I started to say ‘In the name of God the almighty and merciful,' he saw a light around me, and I was placed inside this aura. I felt it myself. I felt the atmosphere suddenly change, and for those 27 or 28 minutes, the leaders of the world did not blink. … And they were rapt. It seemed as if a hand was holding them there and had opened their eyes to receive the message from the Islamic republic." Whether we like it or not, justice, peace and virtue will sooner or later prevail in the world with the will of Almighty God. It is imperative, and also desirable, that we, too, contribute to the promotion of justice and virtue. … I emphatically declare that today's world, more than ever before, longs for just and righteous people with love for all humanity; and above all longs for the perfect righteous human being and the real savior who has been promised to all peoples and who will establish justice, peace and brotherhood on the planet. O, Almighty God, all men and women are your creatures and you have ordained their guidance and salvation. Bestow upon humanity that thirsts for justice, the perfect human being promised to all by you, and make us among his followers and among those who strive for his return and his cause. Someone asked me: "So and so said that you have a connection." I said: "Yes, I have." He asked me: "Really, you have a connection? With whom?" I answered: "I have a connection with God," since God said that the infidels will have no way to harm the believers.